Recipe – FOOD IS LIFE! 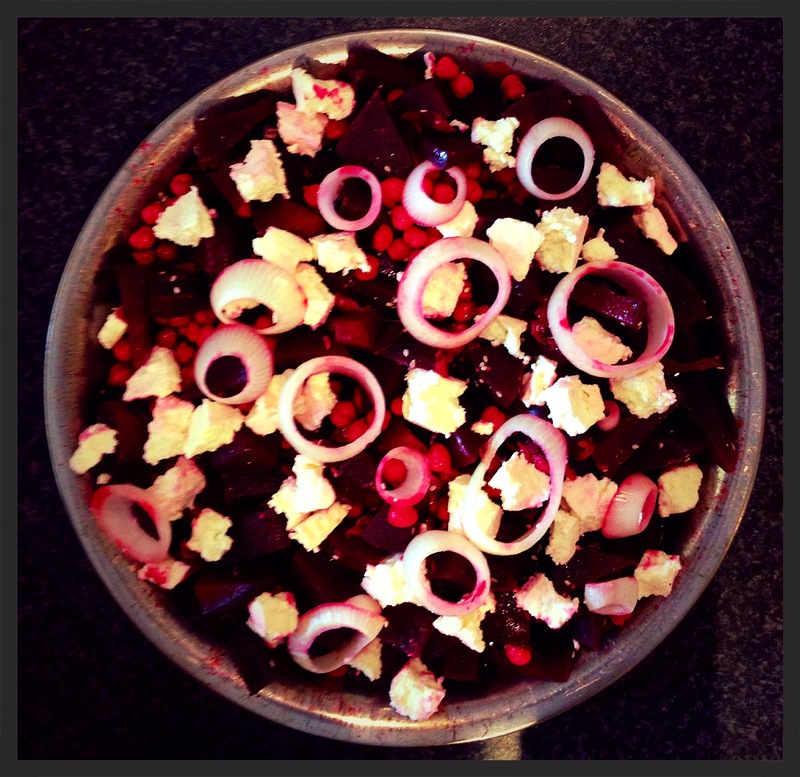 Karina’s Roasted Beetroot Salad with Chickpeas, Roasted Garlic and Ricotta! Preheat your fan-forced oven to 200 degrees celsius. Lightly grease your baking tray with olive oil. Wrap all your beets in foil, then place on a baking tray. When your oven is preheated, place the tray of beets into the oven for 50 minutes. During the last 15 minutes of cooking, grab your whole cloves of garlic, leaving the skin on, along with your sliced white onion, then place with your wrapped beets in your oven. Continue to cook altogether in the oven, until 50 minutes is over. Turn your oven to off, then take your onion and garlic out of the oven. Keep your beets in the oven, allowing the residual heat to further gently cook the beats until you have made your salad dressing. Make your salad dressing by combining your balsamic vinegar, olive oil, cracked black pepper, lemon juice, sesame seeds and sesame oil. Give this a stir, then mince or crush your roasted garlic into the salad dressing. Stir well to combine, then set aside. Take your beets out of the oven, then allow to cool slightly. Cut the base of the beets off, so it makes it easier for you to peel your beets. Use the inside part of a large metal spoon to gently peel your beets. Once your beets are peeled, cube your beets into bite size pieces. Rinse and drain your chickpeas, then add your chickpeas to your chopped beets. Give your salad dressing a final stir, then pour over your beets and chickpeas. Using clean hands, mix your beets with your chickpeas and salad dressing until they get to know each other. Gently pull apart your ricotta cheese or feta cheese, then let it rest on top of your beets and chickpeas. Loosen your lightly roasted onion rings, then let them present on top of your salad. Super good for you salad, which will make your heart ‘beet’ with joy. Get the Right Beat into ya! Karina’s Eggcellent Spanish Chorizo, Basil and Parmesan Omelette! – 1/4 of one Spanish Chorizo, skin removed and sliced thinly. – 1/2 of 1 handful of Fresh Basil Leaves, torn. N.B – You can make your own garlic olive oil, by dry roasting garlic cloves either in a pan, or in the oven until it’s golden brown (it should only take a few minutes). Allow the roasted garlic to cool slightly, then place the roasted garlic into a jar of olive oil to infuse. Keep it in the olive oil for about one week, then fetch the garlic out with a long skewer. You can then use this beautiful garlic oil in any of your favourite recipes which calls for a hint of garlic. Enjoy the flavour sensation! Add your Spanish Chorizo to the pan, along with your olive oil. Fry over a high heat until the bottom side is crispy and golden brown. Flip your Spanish Chorizo to allow the other side to turn golden brown. When both sides of your Spanish Chorizo are crispy and golden brown, turn the heat down to a low heat. Crack your eggs into a bowl, with a pinch of pepper, then beat well with a fork until combined. Add your eggs to the pan, along with your Spanish Chorizo. Wobble your pan with your eggs, until the bottom surface of your pan is coated in egg. Now, pop your favourite wholemeal or grain bread into your toaster. Boil the kettle to get your favourite cup of tea or coffee going. Wait about 1-2 minutes, or until you see the eggs are slightly cooked. Grate your parmesan cheese on top of your eggs. You don’t need to wait for the cheese to cook, since it would have already melted into your eggs slightly. Flip one side of your omelet onto the other, by using a spatula. Turn the heat to off, then you should be able to slide your silky, flavourful omelet onto your plate. Cut your toast to your liking. Pour out your favourite cup of tea, coffee or whatever you like. 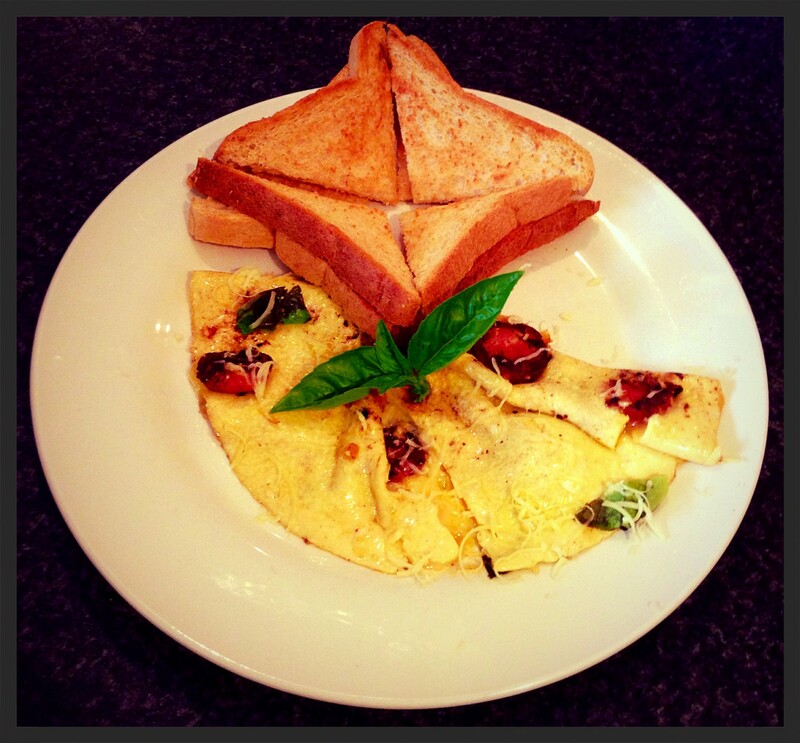 Relax and enjoy your beautiful omelette!